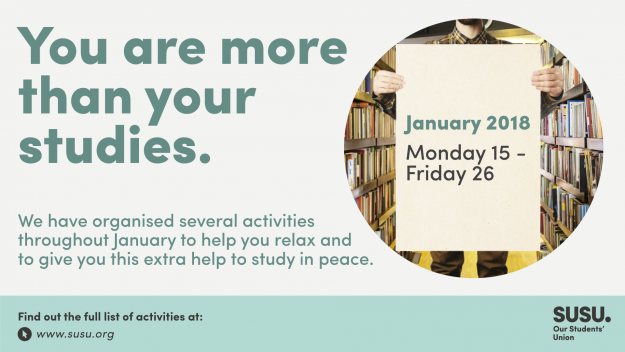 Student Life staff (formerly Residences Support) will be working in the Hartley Library to help support our students through the busy January exam period and will cover the Hartley’s 24 hour opening period. 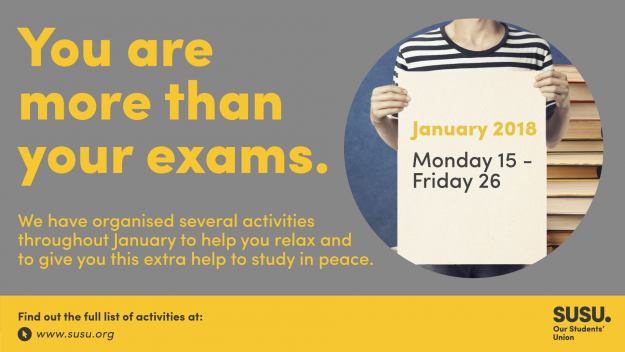 From the 03 – 07 January, two Student Life staff will be available from 17:00 – 00:00, and then from 08 – 21 January they will work from 17:00 – 06:00. Take a moment to relax away from your studies with our meditation session. Grab the popcorn and settle in for a movie night, brought to you by our Postgrad Committee. The adorable Hearing Dogs will be back on campus for you to cuddle and say hello! Check out the photos from last year here. Grab a free tasty smoothie to keep refreshed and healthy during your revision! Be amazed and entertained with our magic show! Bring out your competitive side with a games night in The Bridge, brought to you by our Postgrad Committee. Postgrads – grab a FREE power tea, some cake, and a potted pant for your desk, too! You can also check out our study and concentration tips blog for more ideas on how to stay focused and keep calm. We wish all students the best of luck with exams and hand-ins!